Five centuries of political pans by a lot of old masters and a few new ones, on exhibit at the Met. The greatest collection of Thomas Rowlandson prints in private hands, once owned by art dealer Francis Harvey, was acquired by the Metropolitan Museum of Art in New York City when they went up for auction in London in 1959. 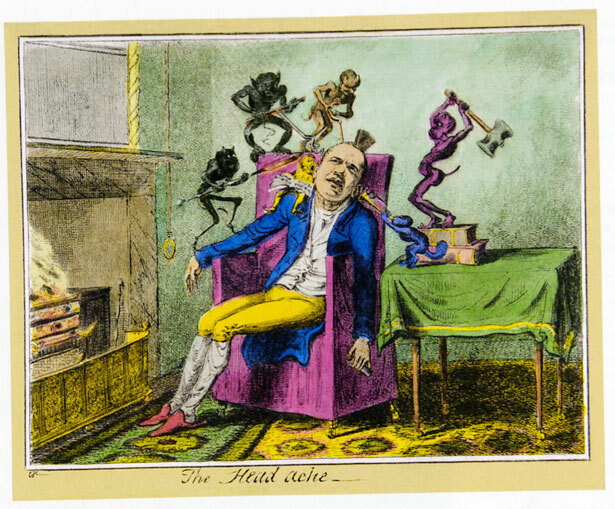 Now, more than half a century later, they can at last be seen, together with the museum’s other masterpieces of caricature, in an exhibition at the Met called “Infinite Jest” (closing March 4). That title, borrowed from the graveyard scene in Hamlet, where the prince contemplates the skull of the court jester, seems just right for a five-century survey of man’s folly. But the subtitle, “Caricature and Satire From Leonardo to Levine,” is, I’m afraid, a case of misleading advertising. It implies that the display of caricatures from the twentieth century—David Levine’s century—will be treated with the same respect and thoroughness as earlier centuries. They are not. The entire twentieth century is represented by a pitifully small group: Al Hirschfeld, Joseph Simpson, the tenor Enrico Caruso, Levine and a couple of Mexican woodcut artists. Nowhere on the walls of the Met will you see William Auerbach-Levy, Isabel Bishop, Ralph Barton, Ronald Searle, Feliks Topolski, Peter Arno, David Low, Will Cotton, Pat Oliphant, Philip Burke or the unique midcentury caricaturist Miguel Covarrubias. And it doesn’t get much better at the Leonardo end of the exhibition. We have every right to expect that in an exhibition of comic art from the turbulent sixteenth century we would see the caricatures that Protestant artists were drawing of the Pope and that Catholic artists were drawing of Martin Luther. It was, in fact, the Reformation that made an industry out of political cartooning and inspired some of Europe’s greatest artists—Dürer and Holbein, to name but two—to join in this propaganda war. Their woodcuts and engravings were distributed across Europe. But you would barely know that the Reformation existed from viewing the walls at the Met. There is exactly one print, an engraving by Pieter van der Heyden, ripping off some images of Hieronymus Bosch, that may, perhaps, be an indictment of the excessive trappings of the Catholic Church, but it’s a far cry from the powerful, pointed political commentary that was being produced in Germany and the Netherlands at that time. A great opportunity to display the first instances of anti-clerical cartooning has been missed, and with it some of the most famous woodcuts of that period. But when we finally arrive at the English printmakers of the Georgian period—George and Isaac Cruikshank, Thomas Rowlandson, James Gillray and James Sayers—we are almost ready to forgive the Met curators everything. For we are in the presence of the most brilliant cartoons ever drawn with an etching needle. The seeming effortlessness of their draftsmanship makes us smile even before we try to get the joke. And the pigments that were used to hand-color these prints is another miracle. How have they managed to stay so vibrant and strong over two centuries? If you have only seen a Rowlandson or Gillray in reproduction, you’ll be surprised by the vividness of the color in the originals. Once Napoleon became a threat to England, King George suddenly realized he needed these able-fingered men for the propaganda war to come. In the Napoleonic Wars the French were heavily outclassed, without notable weapons to compete with Britain’s big guns, Rowlandson, Gillray and Cruikshank. These three caricatured the ambitious Corsican with images so unforgettable that to this day many think of Napoleon as a short, power-mad general, wearing an absurdly ornate military uniform. In fact, his uniform after 1800 was relatively modest, and his height, five feet seven inches, was quite average. 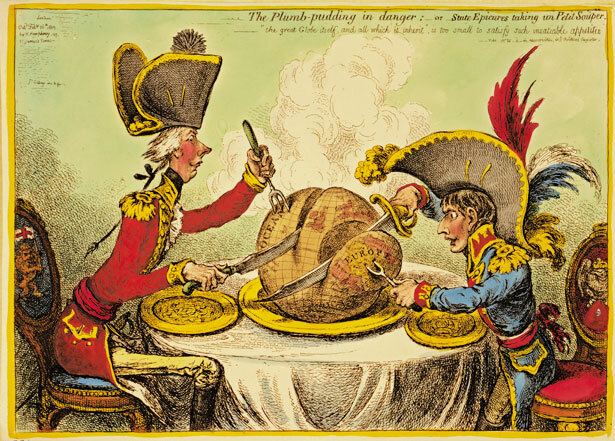 Perhaps the most familiar print to come out of Britain’s wars against Napoleon is Gillray’s “The Plumb-pudding in Danger;—or—State Epicures Taking un Petit Souper.” In it William Pitt, Britain’s prime minister, and Napoleon dine at a table where they carve up an enormous plum pudding in the shape of the globe. Napoleon slices away all of Western Europe, including Hanover, a state belonging to George III. Pitt, for his part, has his fork in the Atlantic, and his knife is halfway to controlling half the world. I find this cynical view of the conflict remarkable. Here was Gillray, his country in the midst of an all-out war, pointing out that the voracious imperial appetite of Britain was not terribly different from that of the alleged madman it was trying to eliminate. Conceptually it is one of the most mordant commentaries on the Napoleonic Wars, and one of the funniest. 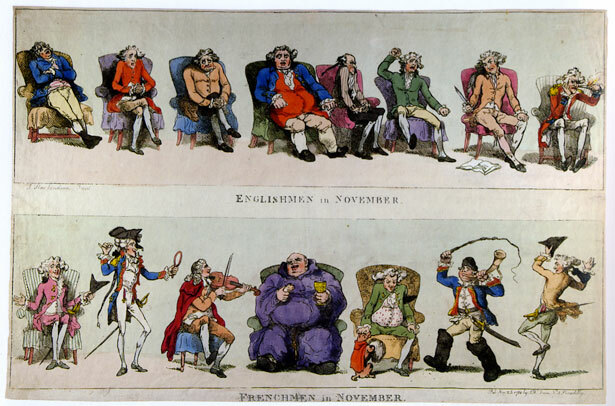 As we move away from these British etchings toward the lithographic cartoons of the Frenchman Honoré Daumier and his acolytes, we are reminded once again how advances in the technology of reproduction always change the character of the art. Lithography, which may be drawn with a crayon or a brush, allowed the caricaturist a new freedom for stylistic individuality that previous generations of woodcut and engraving artists, and etchers, never had. It was also faster. Political cartoonists, now working with a crayon on stone, could comment on events in a matter of hours, and this meant they could appear in the daily newspapers. This was power! Now their cruel caricatures of legislators and monarchs reached millions and swayed public opinion. It wasn’t long before King Louis-Philippe threw a few of them behind bars. For the caricaturist, in particular, lithography was a boon. It allowed subtle facial shading, difficult to do in line. It also gave the ambitious artist a larger press to work with, and thus a larger sheet of paper on which to attempt spectacular panoramas or complex tableaus. The best example of the latter is “Panthéon Nadar.” Today we know Nadar (Gaspard-Felix Tournachon) chiefly for his photographs, but in 1854 he was a celebrated caricaturist. His project was to produce four giant sheets representing thousands of notable playwrights, actors, musicians, artists and authors, who would be numbered and then identified on the sides of the image. He succeeded in completing only one lithographic drawing in his wildly ambitious series, but it is difficult to imagine him doing another without losing his mind. Hundreds of French writers, each one lovingly caricatured, in what is certainly the most spectacular print in the whole exhibition. Talk about labor intensive! Bear in mind that except for the few daguerreotypes taken of some of these writers, Nadar had no photographs to use for reference. Many of the authors he caricatured had to come to his atelier for a sitting. No wonder Nadar decided to take up photography as soon as the camera became a more mobile instrument. In an exhibition full of delightful surprises, one of the biggest was to discover that Gustave Doré, the illustrator and painter of monumental biblical scenes, started his career as a caricaturist. His full-color lithograph An Englishman at Mabille, done in 1861, is a Frenchman’s unflattering view of a typical well-to-do British gentleman visiting that popular dance pavilion in the summer. He has large protruding teeth and a receding chin, a physiognomy that meant English to the French. But when the print was reprinted for an American audience, this ridiculous-looking bon vivant was titled The Southerner as He Was. The print is also an example of the incredible strides that had been made in commercial lithography. Full-color-process printing was just around the corner, and now cartoonists and caricaturists could work in any style, and in any medium, without giving a thought to how it would be reproduced. Toward the end of the exhibit there’s a line drawing by David Levine—a portrait of Claes Oldenburg as a toilet bowl, a comment on Oldenburg’s sculpture Soft Toilet. Levine’s caricature from 1969 isn’t bad, but it certainly isn’t one of his memorable ones. Levine’s work meant so much to so many New Yorkers that to see him represented by a single caricature of such unexceptional quality is maddening. And coming, as it does, near the end of the exhibit, it almost succeeded in making at least one visitor forget the joy that this exhibition had given him.